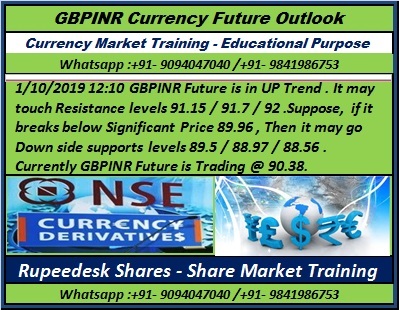 1/10/2019 12:10 GBPINR Future is in UP Trend . It may touch Resistance levels 91.15 / 91.7 / 92 .Suppose, if it breaks below Significant Price 89.96 , Then it may go Down side supports levels 89.5 / 88.97 / 88.56 . Currently GBPINR Future is Trading @ 90.38.